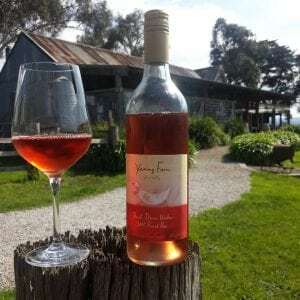 Winery Profile: Yering Farm Wines - Australian Wine Tour Co.
Yering Farm Wines is a small single-vineyard winery that’s nestled in the heart of the Yarra Valley. With its rich viticultural history, warm, family-owned approach and scenic surrounds, it’s not surprising this picturesque vineyard has touched the hearts and taste buds of both locals and tourists alike. To learn more about the winery and its mouth-watering varieties, we sat down with Megan from Yering Farm Wines to chat about the company’s history, winemaking approach and their role in shaping the marriages of couples from across the country. 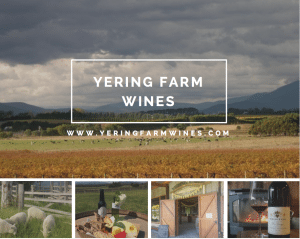 Yering Farm Wines’ 30-acre vineyard can be found along the main tourist road in the Yarra Valley, on the site that used to be home to Yeringa Vineyards in the 1890s. It wasn’t until 1989 that Alan Johns, the chief winemaker at Yering, planted fresh vines and sparked a new era of winemaking. In the vineyard’s early days, the grapes that were grown at Yering were sold to larger wineries in the area, with only a small quantity reserved for Johns own winemaking efforts. Flash forward to the present and Yering Farm Wines is a well-established, family-owned and -operated winery that harvests and produces distinct wine varieties that have helped the vineyard become the popular destination it is today. Renowned for their Chardonnay, Pinot Noir and Cabernet Sauvignon, Yering Farm Wines produces an eclectic mix of distinct wines that also includes Sauvignon Blanc, Merlot and Shiraz varieties. “Our entry level range is called the Farmyard Series, which is made up of fresh, young, easy drinking and affordable wines. These have gorgeous animal labels that were designed by Rosanna Vecchio, the artist behind Stephanie Alexander’s cookbooks. These labels are very popular with our customers and the wines are delicious,” says Megan. The second series in the Yering Farm Wines’ collection is their premium range, and according to Megan, it’s made up of full-bodied, complex wines that are full of flavour. “The final range is the Winemaker’s Selection. These Reserve wines are only produced when Mother Nature has been extremely kind to us. These wines are all about the best of the best. Best quality, hand selected parcels of fruit, brand new French oak barrel fermentation, and limited production. Our current vintages in this range date back to 2006 with a Pinot Noir and Cabernet Sauvignon, along with a 2011 Chardonnay,” she says. 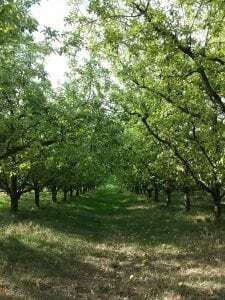 But, the vineyard’s efforts don’t stop with their wine; they’re also the proud producers of some of Victoria best-tasting cider. As the chief winemaker at Yering Farm Wines, Alan Johns takes a slightly less commercialised approach to his winemaking techniques. All of the vineyard’s wines are produced on-site with estate-grown fruit and are carefully crafted and nurtured by Alan himself. “Alan’s hands on approach to winemaking and viticulture ensure that all of Yering Farm’s wines are of the highest quality, while still retaining their individuality. Yering uses French Oak Barrels due to their tighter grain. This allows for more subtle oak influences on our handcrafted wines. Yering Farm uses a range of different sized French Oak Barrels. The larger the oak barrel, the more subtle the oak character achieved as there is a smaller proportion of oak contact with a larger volume of Yering Farm wine,” says Megan. Over the last ten years, the vineyard has developed their own unique approach to winemaking, which encompasses a number of traditional winemaking practices, while also adopting new, innovative technology and methods. “Traditional winemaking techniques are utilised, including the use of open top fermenters, hand plunging and maturation in French oak barriques, which assists in the creation of Yering Farms’ superb wines. We also integrate the latest winemaking philosophies, innovations and wine styles,” she says. Yering Farm Wines has also been the recipient of a number of accolades during its long history and has steadily been increasing the amount of first-class wine that is produced each year, with roughly 6,000 cases of wine made on-site each year. The estate also caters for a limited number of weddings. 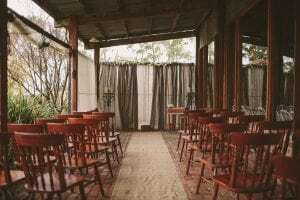 “A select number of weddings are held here each year, each with a unique and rustic style, which is created specifically for each couple. The ceremony is conducted on the sweeping lawn with a backdrop of the estate vineyard and mountain ranges in the distance. When it’s time to eat and drink, head into Yering Farm’s iconic cellar door, a converted hay barn full of rustic charm and historic details. Suitable for both cocktail and seated functions, your guests will enjoy our estate made wines and cider, found only on premise in Melbourne,” Megan explains. 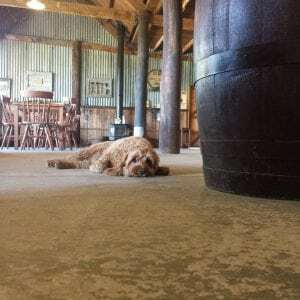 Yering Farm Wines has a lot to offer local, interstate and international visitors, and also has farmhouse accommodation available for anyone who wants to spend a night in the picturesque Yarra Valley. To experience the Yering Farm Wines’ difference, contact Australian Wine Tour Co today about our bus tours of the Yarra Valley.